Not all bum exercises are born equal. And look, we’re busy people, so if we can get the most bang for our buck and get our derrières as peachy as possible in the shortest space of time, we’re in. I asked five of London’s finest trainers to share their favourite bum exercises that really work. You’ll be pleased to hear there isn’t a squat in sight (not to say they’re not good to do). Explains Third Space elite trainer Andy Vincent, “Most people instantly say squats are the best glute exercise, but I would disagree. It’s not an exercise everyone can do, and it’s not an exercise that many people can feel their glutes working. Being able to create a mind-muscle connection is important for developing any muscle in the body.” These moves will activate your glutes, firing them up, so not only will they power your gym sessions more effectively, but they’ll work better throughout the day. You see, gluteal amnesia is basically where your glute muscles forget to work, and the other surrounding muscles have to pick up the slack. Not only can this affect your posture, but with the glutes (maximus, medius and minimus) making up the largest muscle group in the body, the more they work throughout the day, the more calories you’ll be burning. Keep scrolling to find out if you have gluteal amnesia and see the three bum exercises you need to add to your routine. Do my Glutes have amnesia? 1. Stand up straight in front of a mirror, legs hip-width apart. 2. Bend your right leg to lift your foot off the floor. Assess your pelvis; has it dropped down on the right side? 3. Try on the opposite leg. For beginners, a glute bridge is the best place to start, and the great thing about this move is that you can do it at home in front of the telly. “It’s easy to set up and easy to do. All you need to do is work with different tempos whilst doing the exercise or holding at the top to make those muscle fibres twitch,” says Rod Buchanan, Head of Barre at Psycle. 1. Lie on your back, feet flat on the floor under your knees. 2. Draw your abs in, pull your tailbone underneath you and lift the hips off the floor (not your ribs). You should feel both glutes being fired up. 3. Slowly lower to the ground, and repeat. 4. If you want to advance the move, once your glutes are in the air, lift one foot off the floor, and pull the knee into your chest, making sure to keep your abs engaged and your pelvis tucked in so your hips stay level. You’ll really start to burn now, but push yourself that bit further, hold your hips still, tap your toe on the floor and then pull the knee back into the chest a little more. Keep repeating until you feel the burn. 5. Repeat on the other leg. 6. Once you get used to the move, you can try adding weight by holding a plate across your tummy or lying under a padded barbell and using your hips and glutes to drive the bar off the ground, keeping it steady with your hands. 1. To set up, you need a bench, barbell and ideally Olympic plates, as they are round and make set up easier, plus they give the lifter enough space to get out if they fatigue also I’d suggest using a barbell pad or Airex pad to protect the hip when the bar is in position. 2. Sit on the floor with your back against the long side of the bench. Sit tall with your shoulder blades above the edge of the bench, and roll the barbell (with pad) so that barbell is positioned in the hip crease and is centred to your body. 3. Bring your feet in so that they are about a trainer’s length from your bum, as you sit on the floor with feet roughly hip-width apart. (Note: If you’re using it to pre-activate your glutes prior to a big lift, like a squat or deadlift, try to closely match the foot width and angle you will be using on the next lift). 4. Extend your hips up so that you come parallel to the ground. Keep your chin tucked into your chest throughout the lift. 5. Try not to just think about pushing straight up as far as you can. Instead, towards the top of the lift, think about tilting the pelvis and finishing with the glutes as activated as you can. Pause for two seconds before coming down. Keep your abs braced throughout the lifts, and exhale on the way up. “Why is this my favourite bum exercise? If you lack in glute development, you can generally benefit from strengthening the entire posterior chain (lower back, hamstrings and glutes). One of my go-to exercises would be the ballistic kettlebell swing. Why? Because in order to do this exercise correctly, one must learn to hip hinge properly and encourage efficient glute activation,” explains Felix Ma, mobility expert and personal trainer at FitMiBody. “While Kettlebell swings often look relatively easy, the movement is often done incorrectly, causing people pain in their lower backs and incorrect muscle engagement,” he adds. 1. Stand shoulder-width apart with a kettlebell in front (about a foot away). 2. Bend at the waist (hip hinge), and grab the kettlebell handle with both hands. “Pack” your shoulders down and back, and brace your midsection. You should feel rock solid. 3. Lift/pull the kettlebell off the ground, and allow it to travel between your legs. It’s important to bend your knees slightly in order to load the glutes and hamstrings (without rounding your back!). 4. Thrust your hips forward until you stand straight and glutes are fully contracted at the top. The kettlebell will propel into the air (up to chest height) from the momentum. Avoid lifting with your hands. 5. 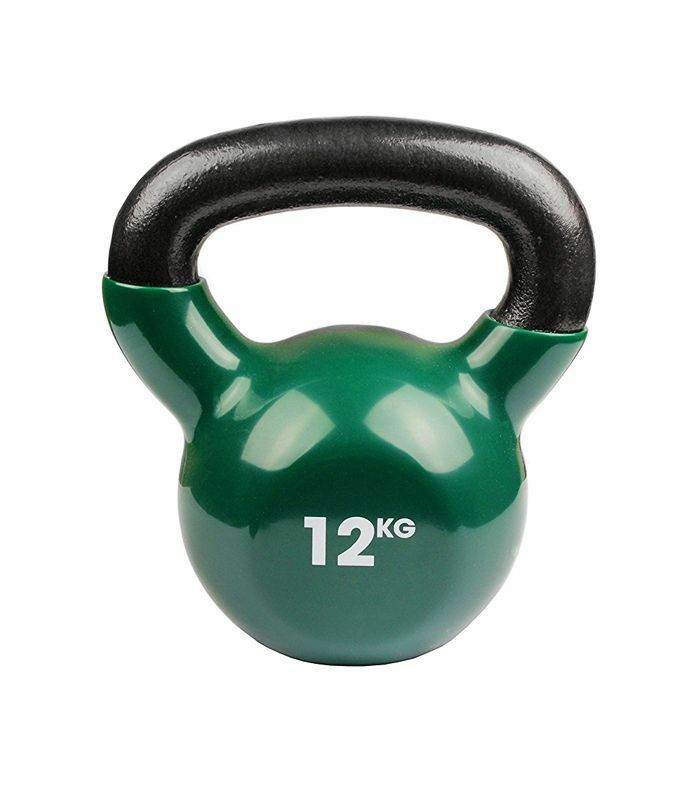 Allow the kettlebell to descent back down between your legs, and move with the weight back into the hip-hinge position (again making sure your knees are slightly bent). As you perform the desired rep amount, you should aim to create a pendulum effect throughout. Next up, how to get rid of belly fat.